The average order value (AOV) of smartphone traffic to online retailer websites reached $97.39 in the second quarter of 2012, higher than that of tablets ($96.11) and traditional devices ($91.86), according to a report by Monetate, which analyzed a random sample of more than 100 million online shopping experiences for the quarter. The reported second-quarter smartphone AOV ($97.39) was down from the $104.96 recorded in the previous quarter. 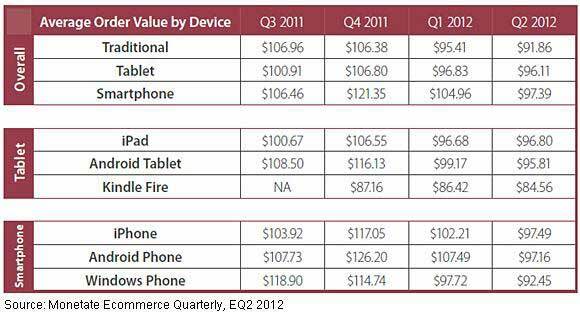 By contrast, tablets recorded a comparatively smaller quarterly drop in AOV, from $96.83 in 1Q12, to $96.11 in 2Q12. In the smartphone category, iPhone users spent more money when shopping via their devices. iPhone traffic to retail websites recorded an AOV of $97.49, beating out both Android ($97.16) and Windows ($92.45) smartphones. That's the first quarter since 3Q11 that iPhone users have recorded the highest AOVs.